Everybody cheats. Shocking isn’t it? 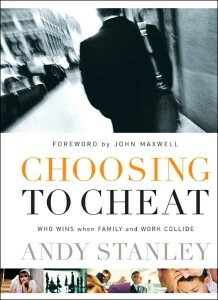 That is just one of many thoughts in the book Choosing to Cheat: Who Wins When Family and Work Collide by Andy Stanley. 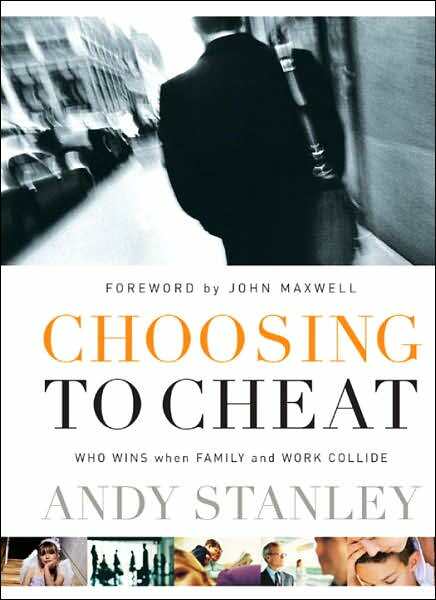 This was a book suggested during one of The Union marriage events in 2009. It is a short read (125 pages excluding the study guide) that helps shed some light on how we choose to prioritize our time between our family relationships and our work. Stanley, also, talked about how we cannot leave the success of our families to chance. We can sow the seed of time in our families and reap the fruits of success. “Happily married couples never attribute their success to unexpected opportunities, market conditions, luck, or good timing. You have never met a healthy family who chalked up their success to being in the right place at the right time. With family, success is always related to time.” When you invest time with your family, you can never go wrong. So allow me to encourage you to read this book and take inventory of the time you spend with your family and the time you spend away. Remember you are the only spouse or parent people have, and we aren’t as expendable in our families as we are on the job.